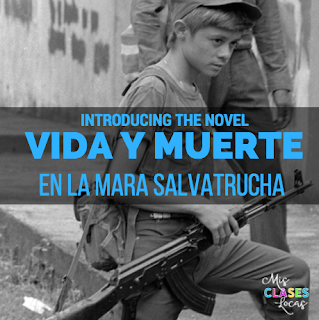 This summer I blogged about Resources for teaching Vida y Muerte en la Mara Salvatrucha. Well now that I am back from maternity leave, I have actually been able to put these hypothetical plans to use for my Spanish IV. I knew I only had nine instructional days (plus the two Fridays of El Internado) before we would be on Thanksgiving break. Instead of splitting up the novel over break, we spent all nine of those days introducing the novel using the rich cultural context of the setting and themes. You may be thinking, how did you spend NINE days introducing a novel? Well, actually I could have used more. I think one of the biggest mistakes people make when first teaching a novel is not spending enough time introducing it. By spending time in advance exposing students to the country of origin, historical context, and current content with novel specific vocabulary, actually teaching the novel will go much smoother. For example, while I was gone students read a novel, but the sub did not have them do the weeks of prep work that I usually do first, which includes watching two movies that set up the foundation for being able to analyze the novel. The students told me they did not understand the novel, and therefore that they did not like it. It makes me so sad that they missed the whole point of an awesome novel, because they were not given the foundation on which to properly "get it." I digress, but here is how I introduced the novel Vida y muerte en la Mara Salvatrucha from Fluency Matters. Make sure to get the NEW Teacher's Guide too. I used to have students watch movies at the end of a unit, but it is so much more powerful to watch one as cultural context before reading a book. Since the authentic movies I show are not the same as the books, it is not spoiling the book for students (unlike in English class, where watching the movie version will keep students from actually reading the book). We started by watching the movie Voces Inocentes using the awesome guide from Kristy Placido. It is rated R, but I have all students and parents sign a permission slip at the start of the year for both El Internado and movies. Honestly, besides violence there are just a few swear words. If you are going to teach this movie, make sure to buy the movie packet from Kristy. It is so much more than just a movie guide with all kinds of other resources as well, which you will see below in our plans. We used the song activity from the movie packet to introduce the song that plays in important role in the movie, and the war in El Salvador. We used the guide questions from the movie packet to help keep them focused, as well as to provide discussion in Spanish during and after the movie. After discussing the movie students worked together in groups to organize the cut up events of the movie (from the movie packet). For an assessment, students took the included quiz over the movie. I usually just collect the movie questions, but since many just get those answers from friends, the assessment actually showed me who had been paying attention to the movie and in class, and not what their neighbor knew. We used the song activity from the movie packet to introduce our discussion on child solders around the world. The students really liked hearing Ska music in Spanish, since some say "all music in Spanish sounds the same." The interesting thing is if you just listen to the song, you would think it is fun and positive, until you analyze the lyrics about child soldiers. We then used the reading and discussion questions (from you guessed it the movie packet) to talk about child solders around the world. We used the great, comprehensible slide show about El Salvador and the Civil War by Kara Jacobs to continue our discussion, and put together everything we had done so far. I had been doing a lot of teacher centered comprehensible input, so both the students and I needed some time for independent guided inquiry. 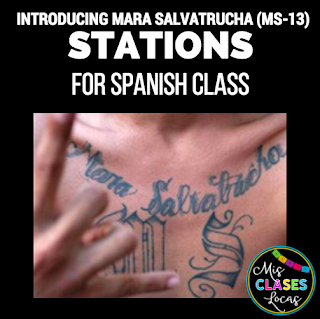 I knew the students still needed to have a base on the MS-13 gang before starting the novel, so I created these MS-13 cultural stations for them to complete. We are 1:1 with Chrome books, so they each completed their own Google document, which had links included for authentic resources of articles in both English and Spanish, videos, pictures, and an infographic. If we were not 1:1, I would have done them as old school stations, printing out materials, and having computers available to work together for videos. When we get back I plan on having a recruiting day where an administrator removes a student from class, like when students were taken during school at age 12 during the Civil War as child soldiers. I wish I would have done it earlier, but it will still be a good "hook" before we start the novel. We will also do some pre reading discussion, as found in the NEW Teacher's Guide. Hopefully, I will share some posts as we read as well. Have you taught this novel? How do you introduce Vida y Muerte? Do you have any other movie ideas? My district has a strict no rated R movie policy. The documentary Which Way Home on Nexflix! Curious: did you do the items you list above in the order you list them above? I have all of the great resources from you, Kristy and Kara, but now I am trying to figure out what to do when. Thank you! Yes, this was the order we did them! So many great ideas! I'm pleasantly overwhelmed! Many questions are coming to mind but... How do you have kids organize all the handouts you give them from the packets, vocabulary, essential questions, etc? Do they keep them in their notebook or do they turn things in for a grade? Trying to wrap my head around how to do this novel for the first time! Thanks! I used to be really into making them have binders, but now I just let them do what they want. We use Standards Based grading, so the on;y grades are assessments. Everything else is just practice!